Ever since I upgraded excalibur (bare metal IPv6 router running BGP and tunnels) from Linux past version 4.14 I've been having some weird IPv6 FIB problems. The host takes a few full IPv6 BGP feeds (currently ~60K routes) and puts them into the Linux FIB via FRR. It also terminates a few OpenVPN and 6in4 tunnels for friends & family and happens to also host dax, the VM where prolixium.com web content is hosted. In the above case, the route was there, a Netlink confirmed it, but no traffic would flow. The fix here was to either bounce the interface, restart FRR, or reboot. (excalibur:12:32:EST)# vtysh -c "conf t" -c "no ipv6 route 2620:6:200e:8100::/56 2620:6:200e::2"
(excalibur:12:32:EST)# vtysh -c "conf t" -c ipv6 route 2620:6:200e:8100::/56 2620:6:200e::2"
Downgrading from 4.19 to 4.16 seemed to have made the situation much better but not fix it completely. Instead of 50% routes failing to work after 90 minutes only handful of prefixes break. I'm not sure how many a handful is, but it's more than 1. I was running 4.14 for about 6 months without a problem so I might just downgrade to that for now. I did try reproducing this on a local VM running 4.19, FRR, and two BGP feeds but the problem isn't manifesting itself. I'm wondering if this is traffic or load related or maybe even related to the existence of tunnels. I don't think it's FRR's fault but it certainly might be doing something funny with its Netlink socket that triggers the kernel bug. I also don't know how to debug this further, so I'm going to need to do some research. Next step here is to downgrade the VM to a 4.14 and run the same thing. It's possible I could just be burning out Netlink and this is normal, but I'm suspicious. Something definitely changed or got bugged in Netlink after 4.14. After testing a few kernels, it seems this was introduced in Linux 4.18. More investigation needed. It's been over eight (8) years since I built a PC with the last one being in 2010, a Core i7-980X (destiny), which was back when Intel actually produced motherboards! The OCZ SSD is pretty old and a 3.5" form factor but it's still working so I have it mounted in ~/tmp for scratch space. 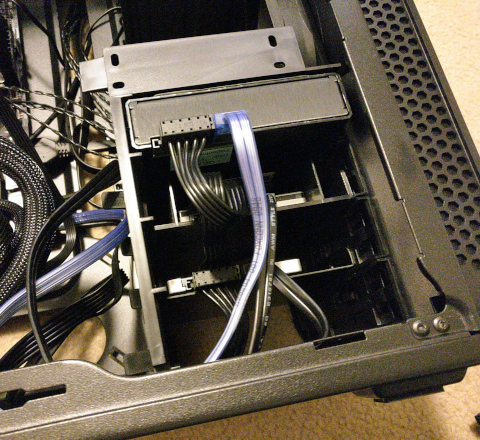 I'll probably replace it or some of the other SATA SSDs with M.2 SSDs if it turns out I need more space. Right now, it's not a priority for me. The Blu-ray optical drives limited my choice in cases, but the 200R is a really nice case and another one of my systems uses the same one so I've got experience with it. The integration was, honestly, pretty easy. I expected more of a fight. 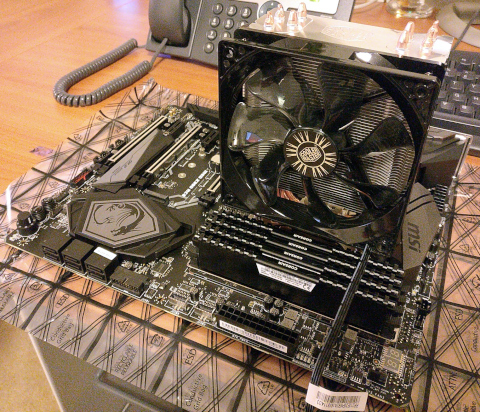 It was a little tricky to get the Cooler Master heat sink oriented and attached to the processor but I wasn't in a rush and took my time. 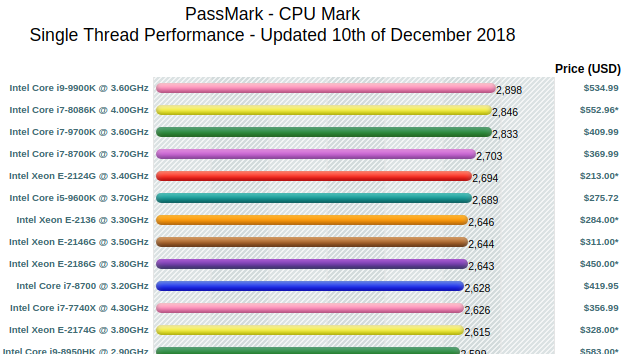 I say almost final because the OCZ SSD gave me some problems. 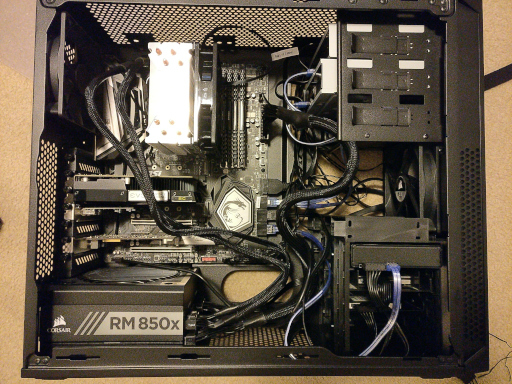 The power and SATA connectors on it stick out pretty far, so the case wouldn't close. I even tried the L-shaped SATA connector that came with the MSI motherboard but that didn't work, either. At the end of the day I just took it out of the 3.5" bay and placed it "free" in the case. Yes, this is horrible and more of a reason for me to replace it with an M.2 SSD in the near future. 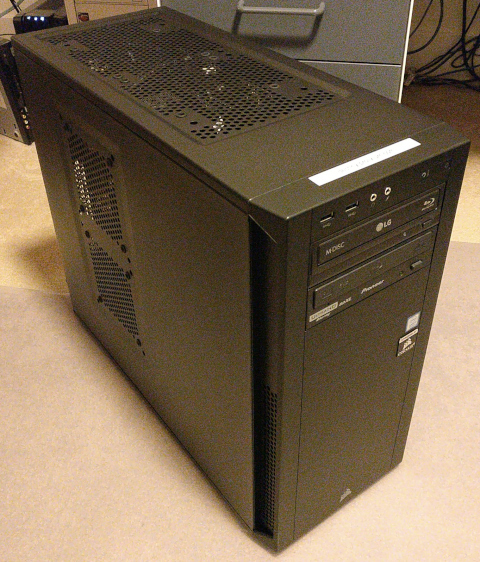 Unlike many PCs I've built in the past, this one worked the first time! After assembling everything the BIOS indicated to me that everything was set to defaults, so I explored a little bit of the BIOS and then booted the OS. The BIOS is really slick, BTW. I'm not one to like GUIs but it's nice to actually see a map of the board with annotations of what's connected to what. &nbs;The one thing that I still think I need to change is the memory speed. 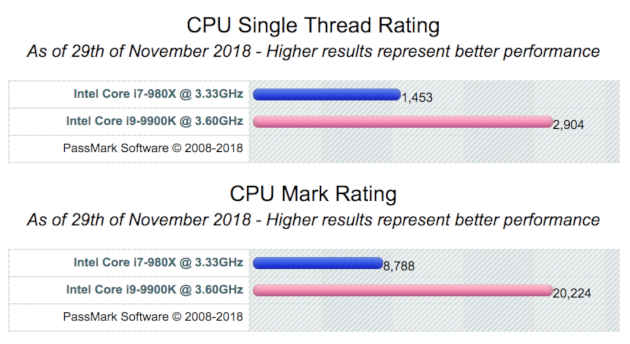 Without OC'ing, Intel rates the memory speed of the i9-9900K at 2666 MHz, which is the speed of the RAM I have. 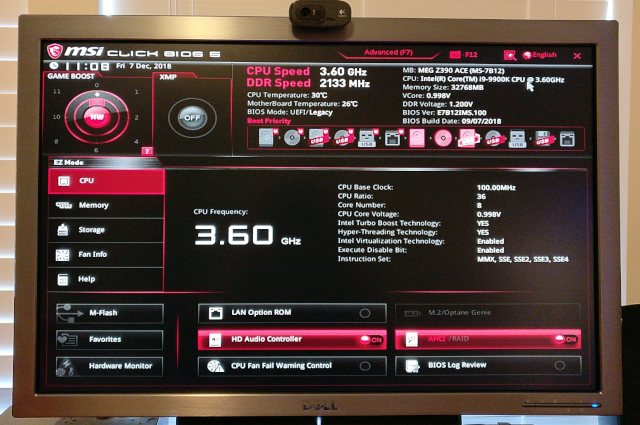 It's running at 2133 MHz right now. I booted up Linux and did some tests running HandBrakeCLI and messing with cpufrequtils. While I can set the processor to run at 5.00 GHz, it throttles itself down to 4.70 GHz under full load at 77°C, which seems fine to me. The default governor is powersave, which runs all cores at 800 MHz during idle times and actually results in lower TDP than the 980X. It's been awhile, so I also fired up Quake 4, which was super smooth even with the quality turned up. Although, most of that is GPU-heavy and even at max vsync (60FPS) only half a core was utilized during gameplay. Find dmesg, cpuinfo, and lspci output here, if you're curious. All grainy cellphone photos are here, too. > Who hosts your cloud provider's status page? Everyone here uses HTTPS. That's nice. Only Google, Vultr, and CenturyLink seem to care about providing IPv6 connectivity to their status pages. Most cloud providers here seem to self-host except for CenturyLink (Google), Linode (AWS), Rackspace (Edgecast), and Oracle (AWS). Vultr might be worried about DDoS so they use Cloudflare as a front-end. Really, this isn't indicitive of anything. I'd probably host my status page elsewhere if I ran a hosting service, TBQH. In the mid-1990s my friends used to brag about how many TVs their family had, how many cars they owned, and, in general, how much stuff they had. I'll admit that I used to brag about how many computers I had or how I connected to AOL over a LAN connection. All of this was annoying. We don't have a land line. We don't use a garbage disposal. The no-car and no-TV statements I hear most often and they're usually stated out of context. These all don't bother me much because I'm an adult but every once and awhile it gets really annoying (hence this blog post). Maybe I should counter these by bragging about my wife and I having no kids. Most modern switches and routers today are based on a Linux or *BSD-flavoured operating system. It's a given that these operating systems are fairly complex but what boggles my mind is when vendors ship them with their products and don't bother cleaning up the initialization scripts. That -a: not found bugs my OCD and makes me worry that the -a argument was ignored because it was treated as a file. The mount error is fun, too. It took me a few minutes to track this down, so I figured I'd share it with the world. Although, I have three "hubs" connected to this machine, so tracking those down is another story. At least I know what I'm looking for, now. The -dev versions above are hand-rolled from the latest source code. There are no pre-built Debian packages for i386 so I was forced to roll them by hand. The 1.6 versions above are actually BIRD. tl;dr I ran into a boot loop issue with my NordicTrak treadmill. Turning off NTP solved the problem. My wife and I purchased a NordicTrak C 990 treadmill in late 2016. It doesn't get all that much use (I still prefer going to the pool and swimming) but we both periodically use it. I have an iFit membership that's mostly a waste of money but allows the machine to report and track my workouts online. The control plane of the machine runs Android 2.x and has always felt pretty brittle outside of the iFit application. Connecting to Wi-Fi, for example, is done through the Android system dialog screens rather than through an iFit-branded screen. Anyway, the whole system was working fine until I decided to use it today. I put the key in and Android indicated it couldn't connect to Wi-Fi. So, I power cycled the system (naturally). Upon reboot the iFit screen would load but then after 10-15 seconds trigger a reboot of Android. I searched around and found instructions like this that described how to reinstall the iFit application. However, these instructions didn't work for me because even if I could draw the "figure 8" on the screen to exit the iFit application's splash page, the OS would still reboot seconds later. I took a guess that something Wi-Fi-related was causing the reboot so I shut the 2.4GHz radios on my two Cisco WAPs (the treadmill is one of two devices that still use 2.4GHz only). The reboots stopped. Something network-related was definitely causing it. Maybe it's some update check that is returning a value that is triggering a bug in Android? 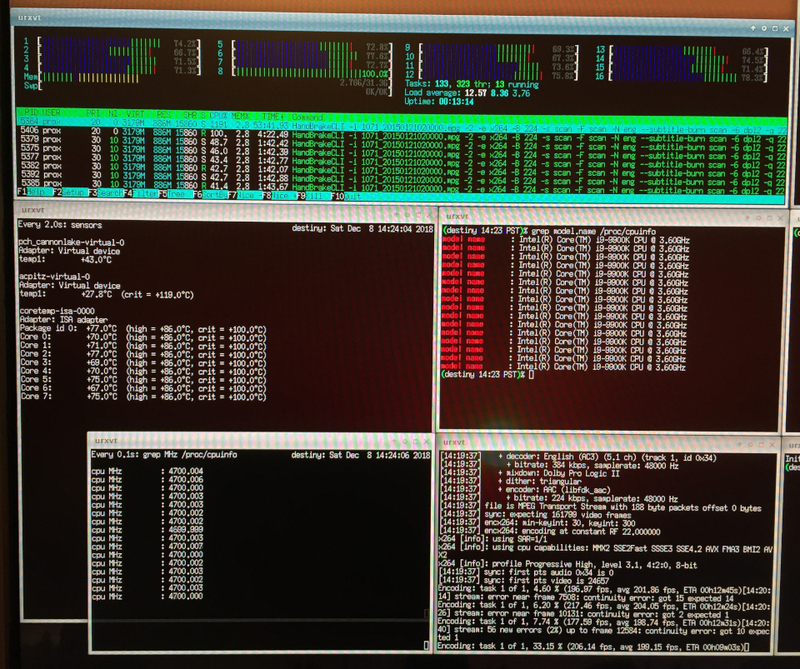 So, I ran tcpdump(8) on my local router. I started a continuous ping and the last packets transferred before the system rebooted were NTP queries. Thinking that something time-related was killing the OS I went into Android settings and disabled network-provided time. The system was still stable after boot even when Wi-Fi is on, now. The system date was 2012-01-01 so I tried setting it to 2018-04-03. Instantly, the system locked up and after a few seconds rebooted. I even tried setting it to a last known good date earlier in the year when I knew the treadmill was still working - same thing, triggered a reboot. It would appear that either something in the OS can't handle the date changing too drastically or there's something that can't handle a 2018 date. So, the treadmill is functional but I now can't login to my iFit account. I'm guessing that somehow the date is passed as one of the login parameters and the iFit platform rejects the login attempt. I'll play more with it later and will not be renewing my iFit membership if I still can't login. Hopefully this post will be useful to someone who's given up and about to buy a new treadmill..
Update: I played around with setting the date a bit more. Even setting it to 2012-01-02 triggers a reboot. It would appear the date can't actually be set, now. This HTML for this page was generated in 0.011 seconds.